Sifu David Leung was born in Hong Kong and began his studies in the martial arts at the age of nine. He is a second generation student of Wing Chun’s Yip Man (well known as Bruce Lee’s instructor) under Master Ho Leung and a third generation student of renowned Yang style Master Yang Chen Fu. He is also presently studying Chen style Tai chi, Hsing-i, and Pa Kua under the internationally renowned Master George Xu from Shanghai. 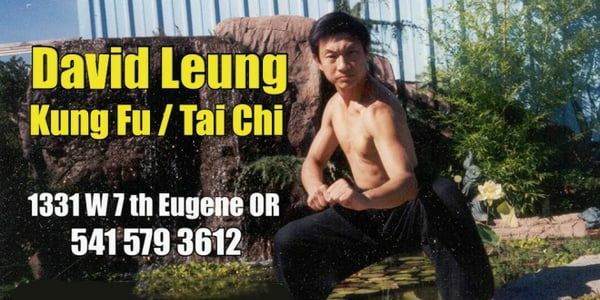 Sifu Leung has been teaching martial arts for over 30 years and has been teaching in Eugene, Oregon since 1970. He offers classes in Tai chi, Shaolin Long Fist Kung Fu and Wing Chun. He was also a teacher of Sociology and psychology at Lane Community College. He was the regional Tai chi instructor for the spiritual leader Baba Ram Dass and a guest teacher at workshops nationwide. Sifu David Leung is the Co-Director of the United States branch of the World Chinese Internal Martial Arts Association, and the honorary president of the Tsang Cheuk Yi Chen Style Tai Chi Association of Hong Kong.